The Federal Aviation Administration has just removed a major hurdle from the path of a vehicle that may well be the first commercially viable flying car. The agency has agreed to classify the Terrafugia Transition as a Light Sport Aircraft [LSA], even though the vehicle is 120 pounds too heavy to qualify for that class. At first reading, this seemed to imply that the FAA had agreed to certify the “Transition.” This indeed would be a newsworthy accomplishment for Terrafugia, and a major milestone in making roadable airplanes a reality. But it also sounded a bit unlikely to us. 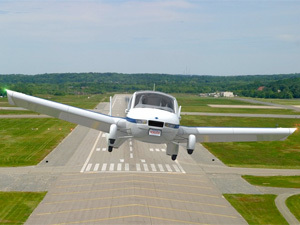 Achieving FAA certification can take years, even for well-tested, conventional aircraft that have been in production for years in other countries. The Terrafugia, in contrast, is a novel design that by its nature will have to compromise on its excellence as an airplane in the service of being a roadworthy automobile. We recently gave Terrafugia a partial exemption to the existing LSA 1320 lb. maximum weight restriction for their Transition® roadable aircraft. The partial grant allows the use of the 1430 lb. limit associated with amphibious LSA. That is to say that what the FAA actually decided with regards to the Terrafugia was not, as the Discovery headline implied, to approve it for sale and use, but simply to categorize it in the same weight category as a seaplane. By analogy, imagine that you were 17 years old, and the Department of Motor Vehicles decided to lower the minimum driving age from 18 to 16. It wouldn’t mean the DMV had given you permission to drive. It just would mean that you could try to pass the test. The partial grant does not guarantee airworthiness approval of the Transition® under LSA. The exemption purposely only addressed aircraft weight and did not address sport pilot, maintenance, or operational aspects of the design. The company only requested an exemption to the LSA weight limit. The company still has to address design, manufacturing, operation, and maintenance issues. The company has a lot more work ahead. An editorial note: The press loves stories about exciting new aircraft, and is prone to pass along the pie-in-the-sky prognostications of their designers uncritically. It should be noted, however, that a) the most successful airplanes are those that are the most ruggedly conventional (cf Cessna 172) and b) we happen to be going through one of the most disastrous times for light aircraft manufacturering in decades. In fact, the fate of the entire LSA initiative is currently in doubt, as even its relatively lax requirements have failed to tap the general public’s fast-dwindling interest in recreational flying. Even if the Transition were to someday achieve FAA certification, that will still leave it a long, long way from achieving commercial success. Our prediction: not only will the dream fail to take flight, it won’t even leave the garage.